Entry No. 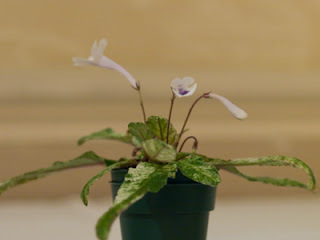 349, Streptocarpus 'Heartland's Snowbaby', exhibited by Dale Martens. Entry No. 350, Streptocarpus 'Heartland's Baby Egrets', exhibited by Dale Martens. Entry No. 351, Streptocarpus 'Heartland's Boyish Grin', exhibited by Dale Martens. Entry No. 352, Streptocarpus 'Heartland's Purple Martin', exhibited by Dale Martens.